Simon Alexander Neil (born 31 August 1979) is a Scottish vocalist, guitarist, and songwriter. A songwriter is a professional that writes lyrics or composes musical compositions for songs. A songwriter can also be called a composer, although the latter term tends to be used mainly for individuals from the classical music genre and film scoring, but is also associated with writing and composing the orignal musical composition or musical bed. A songwriter that writes the lyrics/words are referred to as lyricist. The pressure from the music industry to produce popular hits means that songwriting is often an activity for which the tasks are distributed between a number of people. For example, a songwriter who excels at writing lyrics might be paired with a songwriter with the task of creating original melodies. Pop songs may be written by group members from the band or by staff writers – songwriters directly employed by music publishers. Some songwriters serve as their own music publishers, while others have outside publishers. He is known for his work in the bands Biffy Clyro and Marmaduke Duke. Biffy Clyro are a Scottish rock band that formed in Kilmarnock, East Ayrshire, composed of Simon Neil, James Johnston and Ben Johnston. Currently signed to 14th Floor Records, they have released seven studio albums, four of which reached the top five in the UK Albums Chart, with their sixth studio album, Opposites claiming their first UK number-one album. After their first three albums, the band expanded their following significantly in 2007 with the release of their fourth, Puzzle, creating more mainstream songs with simpler rhythms and distancing themselves from the more unusual dissonant style that was present in their previous three albums. Puzzle peaked at number 2 on the official UK album charts on 16 June 2007. The album went Gold in the UK, selling over 100,000 units, and later in 2012 went Platinum in the UK, having sold over 300,000 copies. Born in Irvine, North Ayrshire, Scotland, Simon Neil formed Biffy Clyro in 1995 at 15 years old recruiting Kilmarnock-born James Johnston and someone known only as Barry on bass and drums respectively, calling themselves Skrewfish. Barry was soon replaced by Ben Johnston, James's twin brother, and Biffy Clyro was effectively formed. In 1997, the trio moved to Glasgow, where Neil studied Electronics with Music at the University of Glasgow. He also Studied Film and TV for a year before leaving to pursue music full-time. By then, Simon's musical tastes had expanded; In 2000, the band were spotted at the Unsigned Bands stage at T in the Park by a Beggars Banquet representative. Soon after, the band was signed to the independent Beggar's Banquet. Irvine is an ancient settlement, in medieval times a royal burgh, and now a new town on the coast of the Firth of Clyde in North Ayrshire, Scotland. The 2011 Census recorded the town's population at 33,698 inhabitants, making it the largest settlement in North Ayrshire. 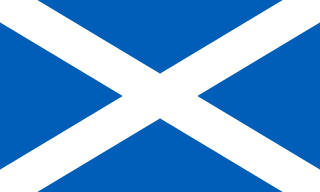 Scotland is a country that is part of the United Kingdom. It covers the northern third of the island of Great Britain, with a border with England to the southeast, and is surrounded by the Atlantic Ocean to the north and west, the North Sea to the northeast, the Irish Sea to the south, and more than 790 islands, including the Northern Isles and the Hebrides. Biffy Clyro have since released seven albums, signed to a major record label, and toured relentlessly. Neil has stated that Biffy Clyro lyrics often come from phrases he writes down in a notebook he keeps by his bed. Neil plays with JP Reid of fellow Ayrshire group Sucioperro in Marmaduke Duke, under the pseudonym "The Atmosphere", which released their first album, The Magnificent Duke , in 2005. It was announced in late 2008 that the Duke was to make a return in 2009 with the follow-up album and second in the trilogy, Duke Pandemonium . The first single from the second album, "Kid Gloves" was released on 9 February 2009. Neil performs under the name ZZC. His debut single, "To The Bone", was used in the BBC’s ‘Radio 1 Rescores: Drive (curated by Zane Lowe)’ project. Neil lives in Ayr with his wife Francesca, whom he married at St. Columba Church in Ayr on 5 January 2008. The song "God Only Knows" by The Beach Boys was used for their first dance, and Neil has the song's chorus, "God only knows what I'd be without you", tattooed on his chest. He is a supporter of the Scottish Premiership football team, Rangers F.C. Fender Standard Stratocasters  – Various different Mexican models, including White, Red, Sunburst (with neck pickup & controls removed), Black, and Metallic Blue. Fender 1960 Custom Shop Stratocasters  – Fiesta Red, Frost Metallic, Lake Placid Blue, and White. Fender Telecaster Standard  – USA model, owned by James Johnston, three tone sunburst, can be seen in the music video for "Living is a Problem Because Everything Dies". Fender Telecaster '62 Custom  – Japanese model, three tone sunburst, can be seen in the music video for "Only One Word Comes to Mind". Fender Telecaster Custom 1972 reissue, black. Can be seen in the music video for "Mountains". Patrick Eggle New York  – Red. Gretsch White Falcon Used live for the song "Diary of Always" and is seen in the music video for "Folding Stars"
Gibson ES-335 – used live for "God & Satan"
Gretsch G2420T - used for music video of "Howl". "Love In The Guise Of Friendship"
Blackened Sky is the debut studio album by Scottish rock band Biffy Clyro. Largely produced with the band by Chris Sheldon, it was released by Beggars Banquet Records on 10 March 2002. The album reached number 78 on the UK Albums Chart, and spawned four singles. A deluxe remastered edition was released in 2012, which featured, in addition to the original 12 album tracks, two songs from the band's debut extended play (EP) thekidswhopoptodaywillrocktomorrow and a number of B-sides from the album's singles. Ira Kaplan is the co-founder, vocalist, guitarist and songwriter of the American indie rock band Yo La Tengo. He is married to Georgia Hubley, Yo La Tengo's vocalist, drummer, songwriter and co-founder. Infinity Land is the third studio album by Scottish rock band Biffy Clyro, released on 4 October 2004 on Beggars Banquet. Jimmy Roberto Johnston is a bassist, vocalist, and songwriter, best known for his work with Scottish group Biffy Clyro. He is also known as Jim or Jimbo and sometimes signs his name as such. The Vertigo of Bliss is the second studio album by Scottish rock band Biffy Clyro. Produced with the band by Chris Sheldon, it was released by Beggars Banquet Records on 16 June 2003. The album reached number 48 on the UK Albums Chart, and spawned four singles. A deluxe remastered edition was released in 2012, which featured, in addition to the original 13 album tracks, a number of B-sides from the album's singles. 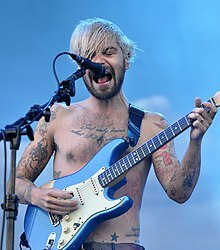 Wikimedia Commons has media related to Simon Neil . 1 2 3 "Biffy Clyro – Simon Neil Guitar Rig Gear and Equipment". uberproaudio.com. Archived from the original on 7 October 2009.